Following the bill’s passage, a number of corporations made conveniently-timed announcements that their workers would be getting raises or bonuses (some of which were in the works well before the tax cuts passed). But as EPI analysis has shown there are many reasons to be skeptical of the claim that the TCJA, particularly its corporate tax cuts, will produce significant wage gains. There was a sharp jump up in the share of compensation going to bonuses between the second and third quarters of 2014, rising from 1.8 to 2.5 percent, but a fairly mild drift upwards since then. The increase from the fourth quarter of 2017 to the first quarter of 2018 was from 2.7 to 2.8 percent of compensation. The sharp fall in December 2018 stands out. If one averages the data for the full years of 2017 and 2018, the nonproduction share of total compensation was essentially flat, rising from 2.60 to 2.63 percent. An examination of overall wage and compensation growth does not provide much in the way of bragging rights for tax cutters, especially given the expectation of rising wages and compensation amidst low unemployment. 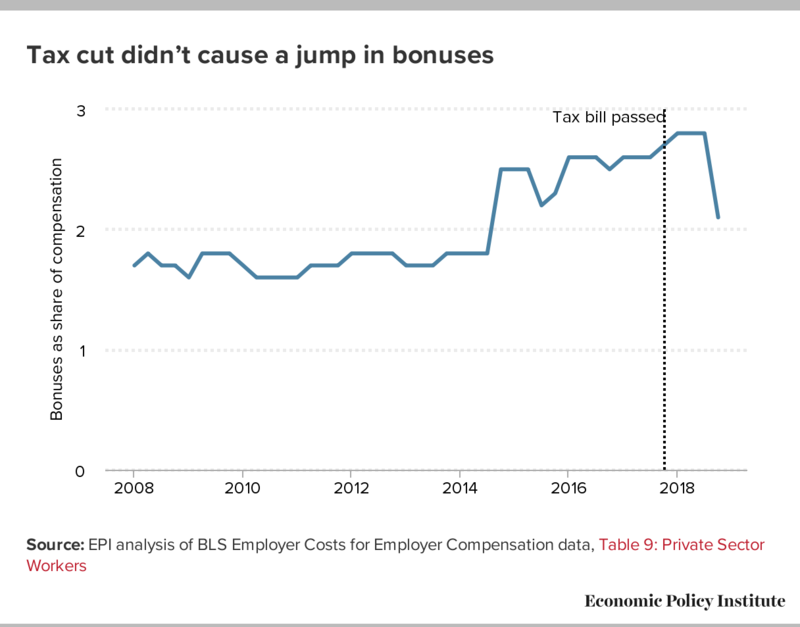 The White House contention that corporate tax cut-inspired widespread provision of bonuses that led to greater paychecks through bonuses or wage increases for workers is not supported by the BLS Employer Costs for Employee Compensation data. This is not surprising. Press releases—“a flurry of corporate announcements”—by a small group of administration-supporting firms do not create widespread bonuses or wage growth for workers. Neither do tax cuts, at least within the first year.